Our driving days are usually pretty interesting. We have guidebooks and experienced caravan leaders to provide us sightseeing ideas to break up the drive. On one stop between Watson Lake and Whitehorse we visited Rancheria Falls — very nice boardwalk leading from the ample parking area to viewing platforms for both sets of falls. Someone went to a great amount of effort to get us to walk there. Although the falls aren’t overly dramatic, nor so tall, they are pretty and we enjoyed the walk as a break from driving. Our group chartered this boat for a three-hour tour of Schwatka Lake and the Yukon River above Whitehorse. The lake was named for a US Army Lt who reportedly surveyed the entire length of the Yukon River by raft in 1883. The boat is nice, has seats on the upper deck and in the enclosed lower deck, and room to walk around. The lake, dammed in 1958, was calm and mostly very wide. There are very few houses visible at lakeside but it seemed a beautiful spot to have. They showed us the ruins site of the US Army’s 1940s tremendous laundry, built at water’s edge to manage laundering for thousands of troops. Only some low foundations remain — an innocuous reminder of a dominating industry along these shores. You might remember two years ago we posted a picture of Deb and Jim by one of the Gllette coal mines tremendous dump trucks. We didn’t nearly come up to the wheel hubs on those. This is a behemoth of an entirely different nature. The wheels are just over ten feet tall, and this very strange critter didn’t make sense to us at all until we went inside and found schematics describing it a little. Once we read the name for it, we understood — this is an LCC-1 Land Train, and the lead machine is a Power Car. This was made by LG Tourneau from Longview TX, and is housed at the Yukon Transportation Museum in Whitehorse YT. Some of the wheels are missing from several cars and a couple of new-looking tires are stacked alongside a nearby hangar. Some of this museum appears under development, including this exhibit, so we were left wondering about the role and reign of this giant “land train”. The Beringia Interpretive Center is adjacent to the Transportation Museum but couldn’t be more different in presentation. This neat natural history museum introduced us to the vast non-glaciated region stretching from Nunavit across parts of Yukon Territory and Alaska into Siberia. The centerpiece of the museum is a reconstruction of the 24,000 year-old Bluefish Caves archaeological site, the oldest evidence of human habitation in North America. The most interesting and favorite part for us is the interactive map and a movie describing the geographical extent and significance of Beringia to paleontology and archaeological studies. We spent all afternoon zooming around Whitehorse in quest of all the historic and cultural sites. We saw the Yukon Visitor Information Center, Yukon Arts Centre and Yukon Archives, MacBride Museum of Yukon History, Copperbelt Railway and Mining Museum, SS Klondike, Tim Horton’s, and this Old Log Church Museum. This museum is in the more than 100 year-old church, one of the oldest buildings in Whitehorse. The former diocesan cathedral houses very nicely arranged exhibits about some of the incumbents who served here and the missions they developed across Yukon Territory. A new cathedral opened on the same grounds in 1960 and in 1978 the Old Log Church was declared a Territorial Historic Site. Whitehorse YT deserves more than the day of touring we gave it. We didn’t have enough time to catch Kwanlin Dün Cultural Centre, or to do justice to MacBride Museum and Copperbelt Museum. 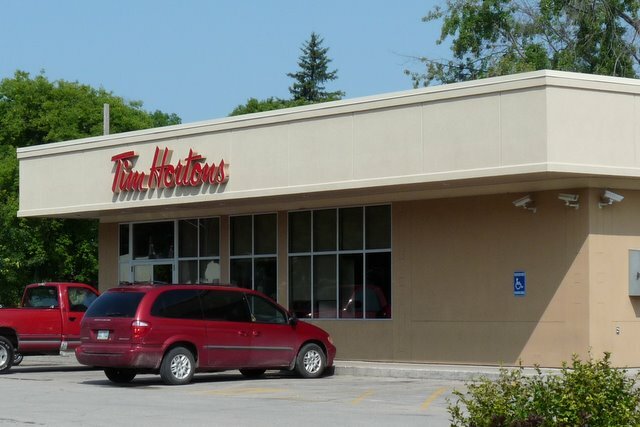 We spent just one cup’s and donut’s time in Tim Horton’s downtown and completely missed the larger location on the west end of town. We rushed a little through the Transportation Museum, and could have enjoyed at least another hour there. Two days wouldn’t be too much to give to this neat Provincial capital. Caravans seem, to us, pretty long at up to 63 days duration. Yet there sometimes isn’t time to spend on all the very cool things we might like at our stops. We thoroughly enjoyed Whitehorse. There is much more to see and some we will enjoy seeing at a more leisurely pace on our own another time. For now, the caravan pushes us forward toward Alaska. We’re not complaining — this is a great way to learn our way around places we’ve never thought of seeing. We do what we can at each stop and we’ll leave something for next time in Whitehorse YT. We hit the big time Monday, speed limits of 100. 100! We can’t even go this fast, we could only keep it at 95 all day. We drove 400 kilometers from Vermilion Bay ON to Portage La Prairie MB. Roads are great! Once we entered Manitoba we hit Trans-Canada Highway #1, just as good driving as any highway in the states. Maybe it’s the Canadian gasoline, or our phenomenal driving method, but we maintained 11.5 mpg until the Winnipeg Rte 100 bypass with a bunch of stoplights. And finished with 11 mpg for the 240 miles day. It’s been a while since we did as well in the states. Our visit with Bill and Donna was wonderful, refreshing, and difficult to give up. They are preparing for family arriving for the Canada Day long weekend and we need to keep heading west. Ah, but the cool nights and pleasant days, sitting by the lake, are perfect. Poor things, Bill and Donna have to put up with this great weather and cool water all summer. The loons are the star of the show at Bill’s and Donna’s. We enjoyed listening to the loons and watching them teach their little loonettes swimming and diving. We filmed a couple of minutes of their action and will share it with you when we learn how. The problem isn’t the tools, it’s the techs. The loons were really cool, though. Prepared with Bill’s and Donna’s suggestions for Tim Horton’s, Husky the Muskie, and Prawda cheap gas, we hitched up and pulled out for an early start Monday morning, left by 11 a.m. Okay, not so early and it means we don’t get off the road by 2 p.m., but we really didn’t want to leave Vermilion Bay and their wonderful lake cabin. They’re perfect hosts and we had a lot of fun visiting and eating with them. Kenora is a pretty community in northwestern Ontario and fronts Lake of the Woods, a tremendous body of water. We should have stopped in town but the parking was very uninviting and we weren’t inspired — I think we accidentally became goal-driven for the day and thought we could get past Winnipeg if we tried. Should have stopped, Kenora looked really nice. And we did finally find a good pull-over spot and caught this fine image of Husky the Muskie in mid-air. Look closely and see the woman on the ground? Gives you an idea how big Husky really is. Our drive was effortless until the Winnipeg #100 bypass with its dozen or so stoplights. These even weren’t so bad, we made good time and skipped around Winnipeg before the rush hour. Then Debbie started looking for a place for our overnight. We had unsuccessfully looked for a nice Provincial Park between Winnipeg and our intersection of #1 and #16 highways. Deb whipped out our trusty 2007 Trailer Life book and found Miller’s Resort just west of Portage La Prairie. And there we were with their free (and very very slow) wifi. Tuesday’s plan is to find a few places to stop and smell the canola, thus avoiding getting destination-oriented. We were doing so well across Michigan’s UP, stopping at so many neat things. We’ll almost certainly stop at one or more Tim Horton’s restaurants to look for wifi. It’s a great opportunity to see if their coffee in china mugs and their doughnuts are still as good as last time. And who knows, they might have wifi now, right? We have time to spare, and even when we’re puttering along on these fine Canadian highways at 95 kph, we’re only doing 57-58 mph, our favorite cruising speed. Okay, it’s Tuesday and we did stop in Portage, walked to the historic muni building, built 1897 and the last example of work by Thomas Fuller, architect for Canadian government. Also we walked toTim Horton’s in Portage, the bank, and to the post office. Do you know neither of these had free wifi? Finally landed in MacDonalds in Neepawa for free internet. The things we do to stay connected with you, eh? How high do we have to go to cool off? Something’s happened to our 75 degrees, and it isn’t just the metric conversion. Somewhat suddenly, yesterday, we spilled out from nice cool mountains onto parched hilly grasslands. Our daily high temperatures soared from high 70s to mid-90s as we hit the western side of the Kootenay Mountain range. Grand Forks offered us one cool moment yesterday morning, we stopped in a Tim Horton’s Restaurant to check for wifi. Nope, you guessed it, they didn’t have wifi in this Tim Horton’s either. We’ll keep checking and let you know when we find a Tim Horton’s with wifi, though. The coffee and pastry were, as usual, excellent. We’re stopped for two nights in the Kettle River RV Park near Rock Creek, B.C. It is a nice park with two very large irrigated and manicured lawn areas and river access. One of the park customs is to sit in your folding chair in the river. The Kettle River runs slowly and looks between 18″ and 42″ deep. We’ll probably find ourselves in it today. Today’s temperature is 91 degrees, and the forecast for tomorrow is 97. Time for us to beat it out of here, gain some altitude before we stop again. Let’s see, 5 degrees per 1,000 feet, we need 3,000 feet. We drove up and down between 2,200 and 5,200 feet three times yesterday before landing on this hot side of the mountains. We’ve spent the past four hours in a coffee shop in Rock Creek getting more than our $2 worth of wifi. Kent and Denise serve superb coffee and we love their cheese corn muffins and fresh baked sausage rolls. The wifi is also excellent, very fast. Jim completed his tasks including downloading needed updates, checking news, and responding to email. Debbie reconciled our accounting and checked her emails. 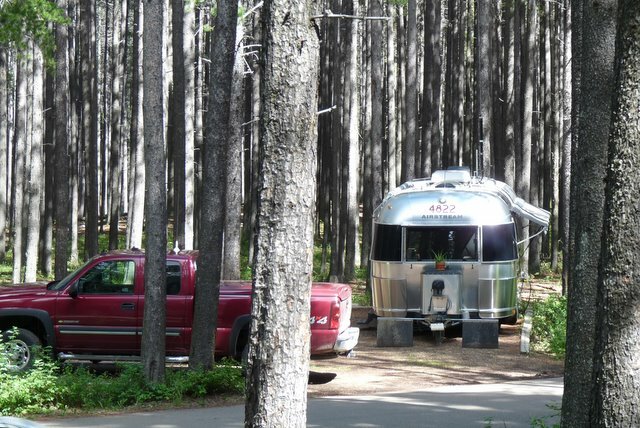 We’ll leave Kettle River RV Park tomorrow morning early, see if we can find a cool, shady spot for a couple of nights. See You Down The Road! We departed yesterday from Canyon Springs between Revelstoke and Glacier National Parks, B.C. Overcast skies, temperatures started out 9 C (48 F). A short drive to city of Revelstoke, stopped for gas and Tim Horton’s coffee and muffins. And caught an ark full of rain the entire gas stop. Boy do they ever need rain around here. Media have announced continued forest fires this side of our day’s destination, Kamloops. We hope the firefighters have the blessing of rain there too. Next we enjoyed an impromptu stop at Craigellachie. We won’t offer a pronounciation — we’ve been offered two already. Significantly though, this is the site of the pounding of the last spike joining CPRs 2,000 mile transcontinental railway November 7, 1885. 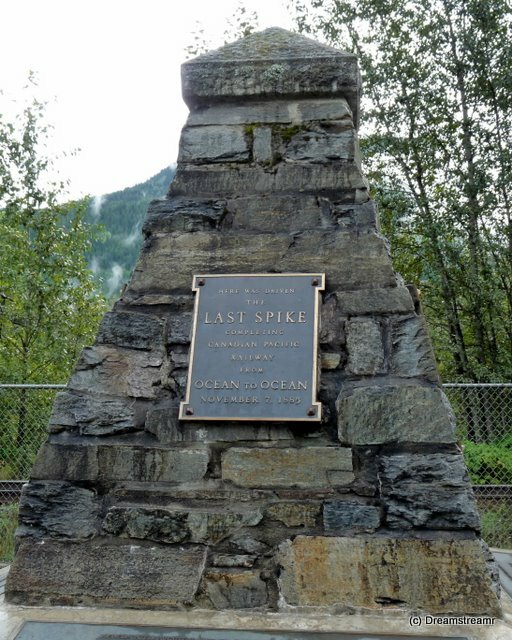 There is a monument, a view of the current version of the last spike valiantly trying to stay in the tie (you know someone must have made off with the first dozen or more), a little shop, and flush toilets. The latter we have begun to appreciate more as the BC Provincial Parks have been lacking only in this. Although we have a flush toilet in the RV, we are in the midst of a dry camping six day run. No dumping, no taking on water. We have done up to four or maybe five days, but not six. So we’re using theirs, not ours. Do you know what will go first, fresh, rinse, or black water tanks? We’ll bring this up again in a couple of days. Our driving weather was clear the remainder of the morning and warmed nicely to almost 18 C (64 F). We found Kamloops alongside the CPR rail line, right smack on Highway #1, and turned north then back east 20 km (12 mi) to Paul Lake Provincial Park. British Columbia did a fine job building up sites on loops terraced up the steep hillside. The roads are terraced, the sites are perched above and below the road for each loop. Each site is nearly level, well-drained, and only a little tight to back into. Kamloops is an interesting place in Thompson Valley west of the Rockies. 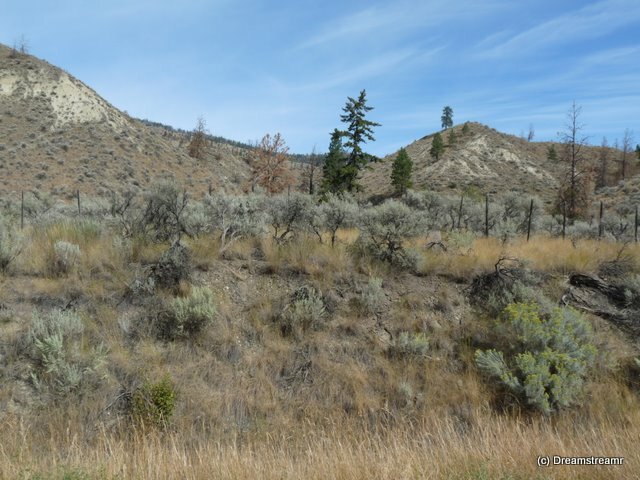 The area was long inhabited by the Secwepemc (Shuswap) Indians and invaded in the early 1800s by trappers and fur trading companies. Currently Kamloops is a transportation hub and home to several large industries including pulp, veneer, and plywood, cement, mining, and Thompson Rivers University. The University has ten thousand students and is the largest employer in Kamloops. But the area is semi-arid, and apparently receives less than .3 meters or 12 inches rainfall annually. So lots of sagebrush, cacti, and rattlesnakes, things we didn’t expect in supernatural British Columbia. This morning, as we prepared for a day trip to Kamloops a tiny Lees-ure Lite Excel trailer pulled by a Mazda Matrix pulled in and parked just around the hill from us. Not just little, it is tiny. The total weight is 470 pounds, the tongue weight is 23 pounds. Our RV weighs almost 7,000 pounds and the tongue weight is 1,000 pounds. On the other hand, we have 180 sf, they have 38 sf. They walked over and spoke, we learned he is an active ham in Kamloops. VE7ODS, Dave Sutherland, and Marg from Kamloops pull the little tent trailer. They drive up to Paul Lake PP to escape the heat — Paul Lake is 5 C (9 F) degrees cooler in the summer than Kamloops. We invited them to join us to chat after supper this evening, then we left for town. The First Nations museum was closed — Labour Day holiday? — so we drove around Kamloops briefly then parked to walk about. The only things we found open were the coffee shops, drug stores, and groceries. Perfect! Our three priorities for today. While Debbie shopped groceries, Jim caught up on email and updated our websitea little. Back to the RV, repackaging food for storage and fit into our compartments. Dave and Marg visited a little while after dinner and entertained us with stories of how Dave came to Canada from Scotland, his call to the pulpit, their meeting each other, and traveling together with various modes of RV and tent. We enjoyed getting to know each other and will look forward to hearing from them again soon. We played Rummikub until midnight, Debbie adding another victorious night to her scorecard against Jim. Poor Jim. But he does keep going back for another drubbing, so he deserves it. Tomorrow morning we drive to Squamish, between Whistler and Vancouver, to Alice Lake Provincial Park. See you there! There’s no cypress in Cypress Hills! We’ve been in Cypress Hills a couple of days. The weather has been just glorious, if a little cool. And then we had rain, off and on, early this morning. It didn’t seem like a lot until I pulled out our street side awning over the windows. Captured water washed over me, wetting my shirt and splashing a little into my shoes. Apparently the rain was more than we had realized. No problems, and we’re glad to sun dry the awning periodically. 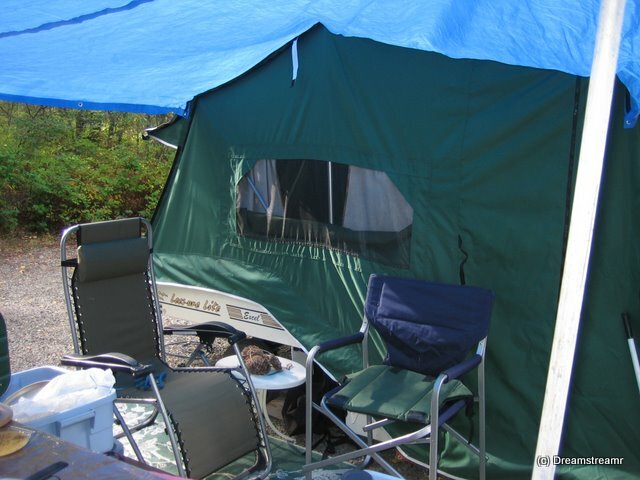 We don’t need any sun shades for our RV in Warlodge, our camping loop of Cypress Hills Provincial Park. We are at the base of hundreds of mature lodgepole pines, the predominant tree in the Park. The sun peaks through the dense stand of tall tree trunks just enough to brighten our trailer’s interior. It seems the sunlight might not often be enough to dry the ground, though. A few words about Cypress Hills Provincial Park are in order. First (and most surprising) there are No Cypress Trees, it was a mistake a very long time ago. This is a full-service campus. I played golf on the very nice 3,600 yard nine-hole course. Debbie and I found the tennis courts, riding stables, and baseball diamond nearby. On another walk we encountered a very nice amphitheater, swimming pool, interpretive center, mini-golf, laundry, propane and petrol station, crafts hall (a young woman was teaching origami), lake with boat rentals and swimming beach, pizza stand, cafe, restaurant, and hotel. And, free firewood is delivered to every campsite, already split. This all is much more than we expected from a “campground” over 100 kilometers from the nearest city. Our previous day was much cooler here, the high temperature was in the low 60s (15 celsius). We heard we could find internet wifi service in the cafe or in the hotel lobby. The cafe wifi worked for almost four minutes then stopped. So we walked up the hill to the nearby hotel. We joined a group of ten people, sitting in the hotel’s comfortable lobby. A restaurant was 20 meters behind us. The lobby looked out through large glass windows onto a pretty outdoor deck with birdfeeders doing a brisk trade. Outdoors temperature was 58F, we were warmer inside. Four children were building dominoes towers (and, of course, noisily crashing them down). One gentleman, sitting by the window, was reading the paper. Two younger men were slowing our wifi internet connection considerably. Debbie was catching up on reading her Readers Digests. A couple of moms were playing with the children. And everyone seemed perfectly content to be indoors, for now. The only thing I thought missing was a nice crackling fire. 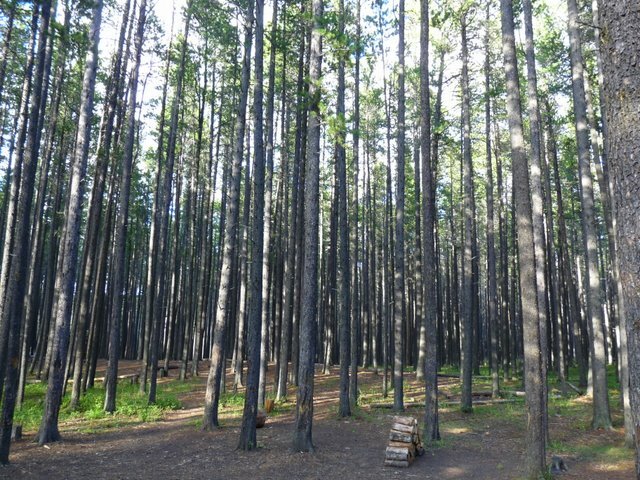 Cypress Hills has six camping loops, not counting the group camping, Bible Camp, and other special camp areas. Among the six camping loops appear to be almost four hundred campsites. Our campsite was large, with easily over 100 feet distance to the next campsites on any side. This Park does not afford campers the high degree of campsite privacy we find in some Canada camping parks. But the distance between campsites creates another kind of privacy, like having just the right volume of music in a well-attended restaurant. You may not notice the music is loud but it somehow keeps you from paying attention to conversations at nearby tables. So it seems here — unless we walk over to talk, we don’t really pay much attention to other campsites. We met a nice family from Leder, over an hour north of Maple Creek. Ed and Dolores have annually summer camped in this park nearly forty years. They started in a tent, then a tent camper, then a cabin trailer, and now a petite fifth wheel (twenty-two feet long). They farmed and Ed did some other work over the years. They brought their children every year with them. And now three of their four grown children are also camping in the park during their holiday. Jim played golf with them. Afterward we both enjoyed a drink with them and getting to know them at their campsite just up the street from ours. The weather on our arrival Sunday was perfectly awful, gusty, foggy, rainy, and cold. The truck and trailer both looked as though they had been taken dripping wet through a sandstorm. Jim cleaned them up a little in hopes we would enjoy some fairer weather on our next drive. And Thursday morning, while cool, was a beautiful driving day. We drove through Red Cliff then to Medicine Hat, where we found great parking near a Tim Horton’s restaurant. Big surprise, eh? We needed a washroom break, and had skipped breakfast. And maybe we could find internet too? Well, the doughnut and coffee were really just what the doctor wouldn’t have ordered but would have enjoyed anyway, had he been there. And we did enjoy the break. This was a long driving day, at 280 miles, to Calgary, Alberta. Is there wifi in this one? We’ve done well to keep our driving days to under 200 miles. Our four day stay at Cypress Hills Provincial Park was two days longer than planned. So the following drives, instead of two 140 or 150 mile days with a break between, became a stretch distance to make up for the days spent. Cypress Hills was well worth the extra days. But we had planned on only two days. We’re glad we had the flexibility to stay longer, and to keep our September arrival date in Vancouver we are minding our calendar a little. And with the gorgeous weather and wonderful smooth and straight roads between Maple Creek and Calgary, and the nice Tim Horton’s stop in Medicine Hat, this was a very easy driving day.